After a successful launch and lots of positive support, I thought I’d write a little about another iconic design, the Moka Pot. In Europe you can practically get them on almost every street corner and its iconic design is copied by companies all over the world. The origin story on this one is a lot clearer than on the French Press. 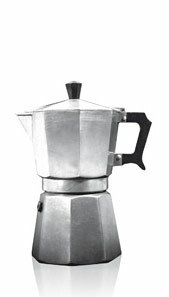 The Moka Pot was originally designed in Italy by Luigi de Ponti in 1933. Afterwards the model was patented by Alfonso Bialetti who then started mass producing it. The original Moka Express model was made from aluminum as the Italians tried to make it the “national metal”. The very same model is still being made to this day in a variety of different sizes. The Bialetti logo is actually a caricature of Alfonso Bialetti himself drawn up by Paul Campani in 1953. The Moka Pot is also, probably even more commonly, known as a “Stovetop Espressomaker”. However, it doesn’t actually make espresso, sure there is a certain amount of pressure involved but not nearly enough to classify the extraction as espresso. Espresso is normally created by pushing water through coffee grounds under ~9 bars of pressure, a Moka Pot will generally create no more than ~1.5 bars. The Moka Pot consists of three parts, the bottom part that holds the water, the filterbasket holding the coffee grounds and the collection chamber. The water from the bottom chamber, is heated by either an external heat source or electrically if you have an electrical version of the Moka Pot. As the temperature in this boiler of sorts rises, so does the pressure inside it. Eventually that very pressure sends the water upwards through the filterbasket into the collection chamber. The Moka Pot uses a significantly finer grind than a French Press, but not nearly as fine as you’d use in an espresso machine. Grounds that are too coarse will result in an under-extracted watery coffee but grounds that are too fine will create a over-extracted, strong and bitter coffee. If the Moka Express doesn’t appear to be working at all there are a few possible causes. Most Moka Pots are still being made from aluminum, which means they’ll work on just about every heat source except for induction plates. Another cause could be that the coffee used is ground too fine which will stop the extraction dead in its tracks. Any pressure created will then be released through the pressure relief valve, a safety precaution. If you see that valve opening, turn off the heat, let the Moka Pot cool down and under no circumstance open it. Once the Moka Pot is cooled down you can empty and clean it and then try again with a coarser grind. 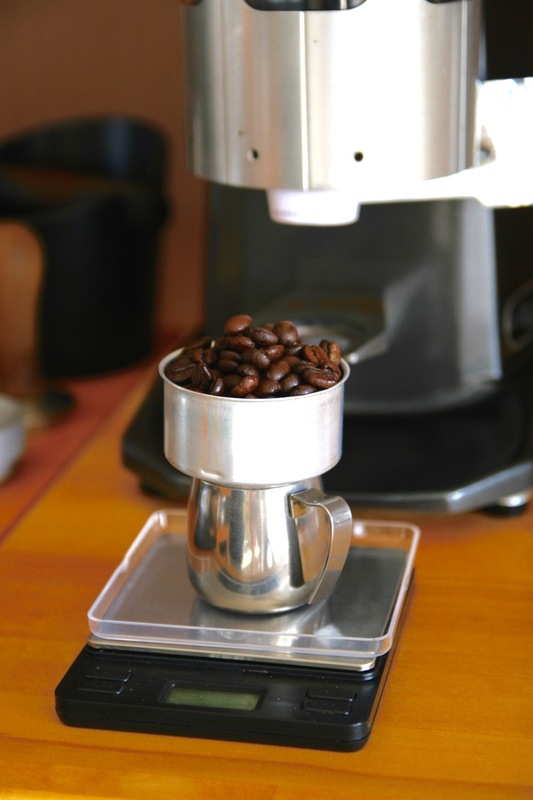 The Moka Pot is probably one of the simplest devices to use but you still need a few supplies. Fill the filterbasket all the way up, do not compress the grounds! Use a towel, the pre-heated water makes for a hot bottom chamber! Don’t put electric Moka Pots on stovetops! To stop the extraction process remove the Moka Pot from the heat source and cool the bottom chamber under a steady stream of cold tapwater. In this step by step I’m using a simple Moka Pot with an external heat source. If you have an electrical version replace step 8 with plugging in the power cord and, possibly, switching the Moka Pot on. Never use an electrical Moka Pot on an external heat source as you will damage the Moka Pot doing so. While not entirely essential, it is recommended to pre-heat the water in a separate kettle prior to pouring it into the bottom chamber. If you use cold water to start the extraction with, the ground coffee will be in contact with heat and the aluminum for a much longer time. As a result of over-exposure the extracted coffee will have a more metallic and bitter taste to it. There are only two variables in making quality coffee with a Moka Pot. One is the most obvious one, using good quality, freshly roasted whole coffee beans. The other variable is the coarseness of the grounds. Although there isn’t a whole lot of wiggle room, using coarser grounds will make the extraction less strong and bitter where finer grounds will result in a stronger, more bitter coffee. Keep in mind that the filter basket has to be filled all the way up, otherwise the coffee grounds will just swim around in the water and will not be extracted properly if at all. Moka Pot coffee doesn’t have a specific name, its taste however is unlike any other. Moka Pot coffee is stronger than espresso and it contains more caffeine because the water is in contact with the coffee grounds for a longer time. Many people find the taste of Moka Pot coffee too strong and add hot water to dilute the coffee to an acceptable level. You can use any leftover pre-heated water for exactly this purpose. I’ll be enjoying my couple of cups Moka Pot coffee today while writing the next chapter in the Brewing Methods series. If you have any questions, suggestions or other comments please leave them below. If you found this article helpful please share it with as many people as you see fit. There are 7 more articles in the Brewing Methods series: The French Press, The Vacuum Coffee Maker, Turkish Coffee, The AeroPress, Hario V60, Cold Brew Coffee and Espresso.